May not apply to all performances. Please confirm before booking. See our Accessibility page for details. Vote excitedly alongside dozens of international talent scouts for 2018’s hottest breakthrough stars in the making, who battle for glory, fame and the shiny moose trophy. Eight truly outstanding finalists beat 300+ new comedians from around the country to win through to this respected award's final. Previous finalists include: Jack Whitehall, Sarah Millican, Josh Widdicombe, Nina Conti, Greg Davies, Jimmy Carr, Rob Beckett, Kevin Bridges, Romesh Ranganathan and Maisie Adam. ‘Discovering future stars... very high standard’ (BeyondTheJoke.co.uk). ‘Let the fun begin’ (ArtsAward.co.uk). 'Potential comedy stars' (Chortle.co.uk). 'Impressive’ (BroadwayBaby.com). 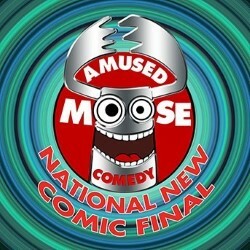 Line-up on www.amusedmoose.com/shows.